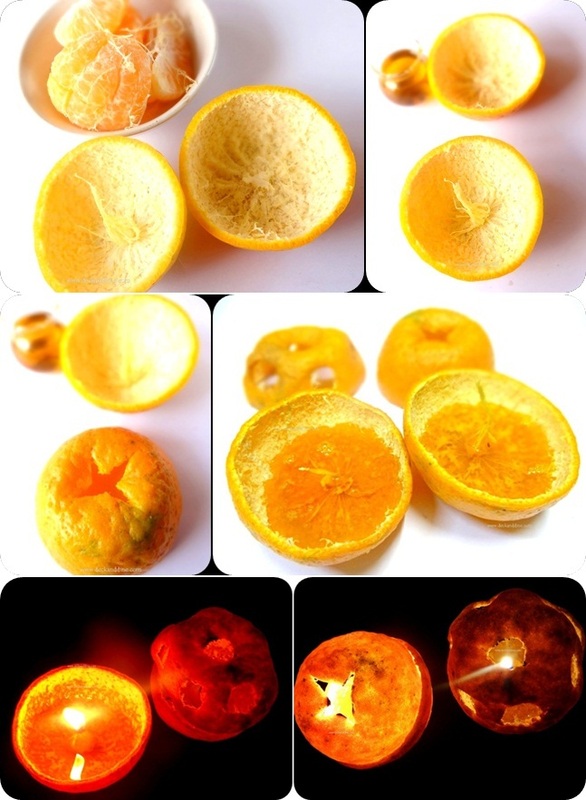 Take an orange, use a sharp knife to cut through the peel, taking care not to damage the pulp inside. Now carefully pull apart the two halves of the orange and separate the pulp. Make sure you keep the stem intact. Clean the insides of the peels and twist the fiber/stem at the center with your fingers to form the candle wick. For the ‘designer’ cover, or to basically shield it from wind, take the top part and cut a design into it to make a cover for the candle. Pour a small amount of oil inside the peel which has the wick and wait a minute or two until the skin and wick soak with oil. Now ignite the stem. Usually you have to try few times before it inflames. So don’t give up if it doesn't inflame on your first attempt. If you get the "wick" wet with the juice of the orange (or lime, or lemon, or grapefruit) then it won't stay lit. So make sure the wick is dry. Keep the orange peel bowl in direct sunlight for a few hours before pouring in the oil. Also, remember you need the oil to soak into the wick for a few minutes. The oil will also soak into the white part of the skin of the citrus so you may need to add just a little more oil for reserve (not too much!). What is really cool is that when the flame really gets going, the oil soaked skin will glow! You can get the top to glow too, but you have to soak that with oil as well...and before you start cutting air hole designs into it. Then you can cut your air hole on top and designs around the sides and voila! If even after holding the lighter on the wick, it just burns without lighting, then you can wrap cotton around the wick and pour oil over it. Then try lighting it.